Today is National Joe Day. It is rumored that back during World War I a man named Josephus "Joe" Daniels, Secretary of the Navy, imposed a ban on serving alcohol on board US Navy ships. Coffee, thereafter, became the beverage of choice for service men. They started calling coffee Joe in reference to him. Celebrate "Joe" day with a cup of your favorite coffee or perhaps even a coffee beer! 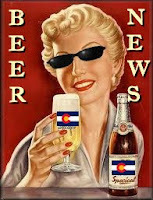 Here's what's happening in the beer world around Colorado today Wednesday, March 27th, 2013. Lone Tree Brewing (Lone Tree) - Here's an opportunity to try some free samples of Lone Tree Brewing beer. Tonight between 6pm and 7pm at Old Chicago Arapahoe Crossing - come meet Bridgette (Jet) and Kane for free samples of some of their amazing beer and get some cool swag from the brewery. Then you may as well stay for some dinner too (not free however). Wynkoop Brewing Co (Denver) - Fresh Rocky Mountain Oyster Stout in cans! Today a small amount of Rocky Mt. Oyster Stout two-packs hit select stores around the metro area. Check out Lucas, Davidsons, Corner Star, Wallaby's, Grape Expectations, Grape Leaf, Daveco, Alameda, Vern's, Wynkoop's brewpub cooler and letspour.com. This is truely a beer with balls! Yak & Yeti Restaurant & Brewery (Arvada) - Today at Yak & Yeti they will be tapping their Brahmin Dubbel Knowledge at 4pm. This beer is an Abbey-style or Trappist-style Belgian beer. This brew weighs in at 7.8% ABV and 14 IBUs and will be served in a 10oz Belgian glass. Also on tap today: Namaste Pilsner, Himalayan IPA, Chai Milk Stout, Jalapeno Lena, GF Apple Ale, West Coast Glutton DIPA, Sherpa Porter, Milk Stout, Yakety Yak Don't Talk Bock, & Pink Peppercorn IPA. Prost Brewing (Denver) - Just a short time left to participate in their tank naming contest. Prost is still accepting entries to name their four fermenters, six lager tanks and a t-shirt design for Prost Pils. Win a growler a month for one year! Email your ideas to kevin@prostbrewing.com or bring them down to Prost. Beer By Design Brewery (Northglenn) - Construction at the new brewery is almost complete. The finish work is almost done and they they've been painting the walls. They are targeting the end of April for an opening. Watch for their countdown to opening on Facebook soon once they start brewing their 1st beer. Black Shirt Brewing (Denver) - This Sunday marks the date for their Red Evelyn Growler Release. Stop in on March 31st between 2-4pm. Finally you can take BSB home with you! It's hand-crafted, hand-packaged, and now from their hands to yours. Red Evelyn is an Imperial Red Rye IPA. Growler cost is $22 for a 32oz fill including the bottle. Limit 4 per person. FATE Brewing Company (Boulder) - Another beer release for FATE! Their Belgian Pale Ale is now on draft and features happy hour pricing all day. Come enjoy this approachable, well balanced, fruity and moderately spicy ale. New Belgium (Ft. Collins) - This week at the 2013 Craft Brewers Conference in Washington, DC - New Belgium CEO Kim Jordan gave a keynote address asking brewers to keep "intentional and intriguing". New Belgium Brewmaster Peter Bouckaert was given the Russell Schehrer Award for Innovation in Craft Brewing. Grats to Peter! Grimm Brothers Brewhouse (Loveland) - You may already know about Grimm Brothers' award winning Altbier called Little Red Cap. 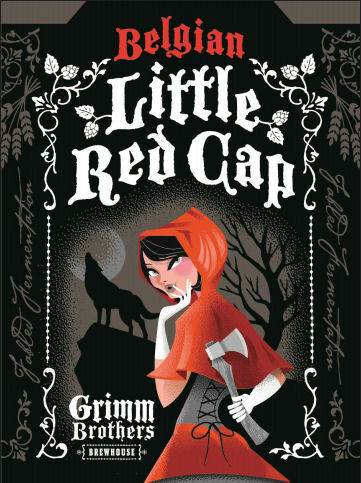 What you may not know is that on Friday, April 5th, Grimm Brothers will be releasing the new Belgian Little Red Cap at their tasting room. It's their famous altbier fermented with a fruity and spicy Belgian yeast to create a fun twist on their most popular beer. Stop in that Friday to try this Belgian cousin of their popular red hued beer. City Star Brewing (Berthoud) - This Easter Sunday, once you've finished letting your kids do their Easter egg hunts, stop on over to City Star between 12pm and 9pm and do a bit of your own. Behind the bar they will have a basket of Easter eggs. Limit 1 per person. Hidden inside some of them is a wooden nickel good for a FREE beer! Just 10 such eggs hold the wooden nickels however, so you'll need to be lucky. Crabtree Brewing (Greeley) - Wednesday special - it's $6 growler fills on Serenity, Dearfield, Raz-A, and Boxcar Brown! They are all itching for summer around Greeley, so despite the chilly high of 52 degrees, a few of us will be enjoying pints on their outdoor patio this afternoon! Will you be one of them? Black Bottle Brewery (Ft. Collins) - This Saturday from 12pm to 6pm will be Black Bottles' first ever Easter KEG Hunt. (Not egg - keg!) - Black Bottle has hidden an Easter keg somewhere in Ft. Collins. Clues will be given out Saturday morning at the brewery. Find each clue at different locations around town and find the Easter keg. Bring the keg back to Black Bottle Brewery and win prizes from all participating Sponsors and BBB. Look also on their Facebook page for a clue. Pateros Creek Brewing (Ft. Collins) - There are just a few days left to get your tickets for the Pateros Coffee Conundrum coffee beer tasting for this Saturday, March 30th! The brewers and the roasters will be on hand to discuss the project, and you get to take home a bag of freshly roasted coffee to boot. Not a bad deal for $10! Two sessions - 1pm to 2:30pm and 3pm to 4:30pm. Phantom Canyon Brewing Co (Colorado Springs) - New beer alert! 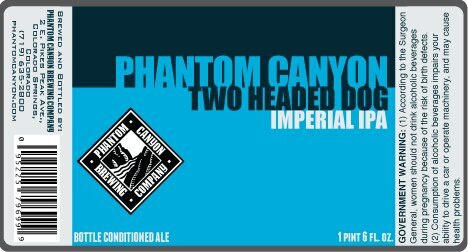 On tap today and soon in 22oz bottles - Phantom Canyon Two Headed Dog Imperial IPA! This year’s version of their Double IPA uses two varieties of hops known for their citrus-like flavors. Sorachi Ace, a Japanese variety that provides a lemony flavor and Citra that imparts grapefruit and orange flavors. The hops are balanced with a hearty amount of malt. It has higher alcohol content and is served in a snifter. 9.8ABV, 100+ IBU. On tap now - soon in bottles. Bon Appetit (Magazine) - Grats to both Wit's End Brewing (Denver) and Verboten Brewing (Loveland) for being named one of Bon Appetit's 10 Favorite US Nanobreweries! Check out the article on Bon Appetit to see who else made the top 10 list.